FILE PHOTO: This is Old Main on the Penn State University main campus in State College. (University Park) — Penn State on Tuesday published a hazing report that showed the university investigated 31 incidents over the past five years, including allegations last year that sorority pledges were forced to lick members’ toes and fraternity pledges had to run routes in a basement while members threw cigarettes and beer cans at them. One-third of the incidents, or 10, were reported during the last school year (2017-18,) possibly indicating better reporting in the wake of the death of Timothy Piazza after he sought to join the Beta Theta Pi fraternity in 2017. Piazza, 19, was served 18 drinks within 82 minutes during a pledge party before falling down basement stairs, suffering mortal injuries. After Piazza’s death, his parents worked to get a new anti-hazing law passed with stiffer penalties and other requirements, including that colleges and universities track and publicly report instances of hazing. That law went into effect late last year. The report released Tuesday represents the first hazing report published under the new law. All but three incidents included in the report stemmed from Greek organizations and the bulk of the incident occurred at the university’s main campus. 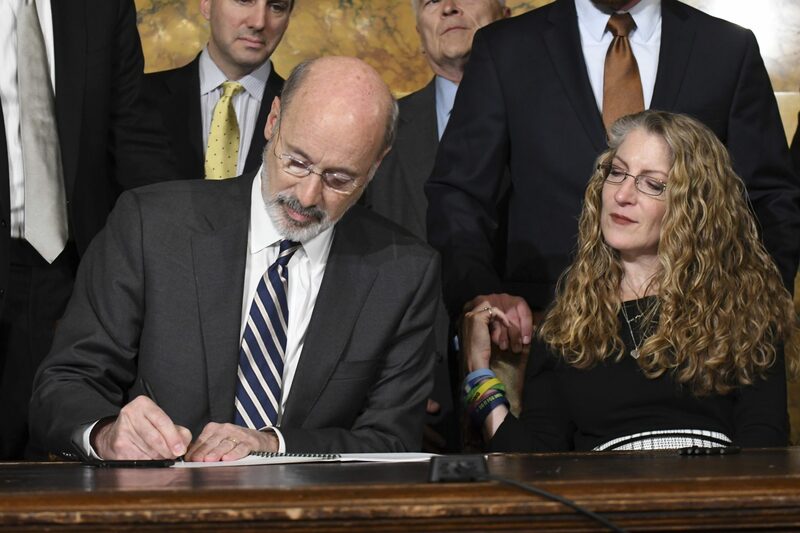 FILE PHOTO: Governor Tom Wolf signs anti-hazing legislation inspired by Penn State student Tim Piazza who died after a night of drinking in a fraternity house, Friday, Oct. 19, 2018 in Harrisburg, Pa. Sitting next to Wolf is Evelyn Piazza, the mother of Tim Piazza. Four of the 10 incidents reported in the last school year involved alcohol-consumption, which was one of the factors in Piazza’s death. His blood-alcohol-level was nearly.40, or five times the legal limit, when he tumbled down the stairs. Three of those alcohol-related incidents occurred in the last school year, including at two sororities. Pledges in the Alpha Sigma Phi fraternity reported forced consumption of multiple bottles of liquor and cases of beer on “bid acceptance night” in November 2017, but the incident occurred the year prior. Members of the Zeta Psi fraternity allegedly forced new members to run errands and on one occasion instructed them to chug a jug of wine in 30 minutes. The fraternity was charged with this incident in April, 2018, and suspended for three years by the university. 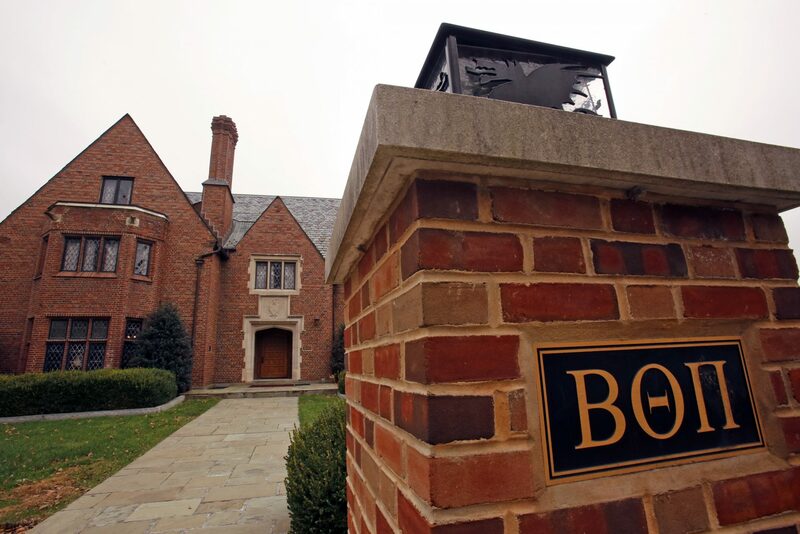 Members of the Gamma Phi Beta sorority said they were forced to engage in underage drinking, servitude and required to lick the toes of members. They were also called “stupid,” and “idiots,” according to the report. The investigation was opened in February 2018 and the organization was suspended for two semesters. The Alpha Chi Omega sorority was suspended for three years after its new members were forced to engage in embarrassing tasks, wearing embarrassing outfits to class, and invited to apartments to engage in derogatory behavior and compelled to drink alcohol. The investigation was opened in March 2018. Members of the Tau Kappa Epsilon fraternity reportedly participated in the Alpha Chi misconduct so their fraternity was placed on one year of probation. Instead of alcohol, most of the reports last year involved verbal abuse, forced work (such as pledges cleaning houses while members did not) or manufactured situations designed to humiliate pledges. The most recent report was filed in October, illustrating that the university still is struggling to convince all fraternity and sorority leaders about the new anti-hazing rules despite the national publicity surrounding Piazza’s death. A pending investigation from September is looking into allegations that new members of the Lambda Chi Alpha fraternity were confined, forced to consume food, deprived of sleep and physically abused. The women’s soccer team was among three non-Greek organizations included in the report. The new members of the team reported verbal harassment, and said they were forced to consume alcohol and wear clothing with derogatory wording on it in 2015. Some of the more outrageous allegations occurred in the earliest school years covered in the report. Members of Phi Sigma Kappa reported forced consumption of drugs and alcohol in 2013 including confinement and extreme physical activity. This is the Beta Theta Pi fraternity house on the Penn State University main campus in State College, Pa.on Thursday, Nov. 9, 2017. In 2015, new members of the Kappa Delta Rho fraternity were forced to clean the house and do laundry for members, even while missing classes. They also were taped or restrained to poles or walls while food was thrown at them and forced to “plank” with bottle caps on their elbows. Similar allegations were reported that year at Phi Kappa Tau. At the Pi Kappa Phi fraternity, new members in 2015 were forced to eat expired food and to participate in bi-weekly line-ups with consequences for wrong answers including being immersed in a large trash can filled with water and ice. University officials said that student safety remains a top priority at Penn State, and the University follows a no-tolerance policy on hazing. “Penn State leaders were early advocates for changes to the law and are pleased that the Timothy J. Piazza Antihazing Law was signed into Pennsylvania law in October,” said Lisa Powers, a university spokeswoman. The law stipulates that all organizations whose members are primarily students, including athletic teams, clubs, service organizations, and similar groups, are to be included in the report. She said the report pulled information from the Student Conduct Office and many other areas. The University’s definition of hazing and hazing policy can be found on the Student Affairs website. Anyone can report hazing anonymously to the Penn State Hotline. Additionally, hazing can be reported to the Office of Fraternity and Sorority Compliance or the Penn State Police. Powers said the University will investigate all allegations of hazing, and disciplinary sanctions may include separation from the University or disaffiliation from the organization or team.